Summary: Playing (HD movie/music) videos on 12-inch Microsoft Surface Pro 3 with 2130 x 1440 resolution is absolutely stunning! If you are unaware of how to convert video to Surface Pro 3 and the new Surface Pro 4, play MKV, MTS/M2TS, VOB, FLV, MOV and H.265 encoded videos on Surface Pro 3/4, read this guide to learn how. So, why convert video to Surface Pro 3? 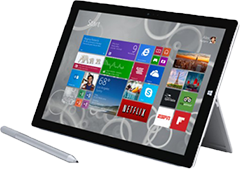 What video formats and codecs does Surface Pro 3 support? Not all portable devices can play all video formats, so does Surface Pro 3. From the feedback of Microsoft support, it's clearly that Microsoft Surface Pro 3 can just play some MP4, WMV and AVI videos. As to other videos like MTS, M2TS, AVCHD, MOV, VOB, MKV, Xvid, Dvix and newly emerging H.265/HEVC encoded ones, SP3 can not open and read. To throw the compatibility matter away, a video converter for Surface Pro 3 is necessary for all SP3 possessors. How to Convert MKV/MTS/VOB/FLV/4K Video to Surface Pro 3/4? Click "+ Video" button on the top toolbar to load or directly drag the source video(s) Surface Pro 3/4 not playable but you wanna watch on SP3/SP4 to the software. After video importing, select: Microsoft Device -> to Surface Video -> Microsoft Surface Pro 3 (AVI or WMV2) at the poping up output profile window. Click "Browse" button to choose the path of destination folder for saving converted video for Surface Pro 3/4, and then confirm it. 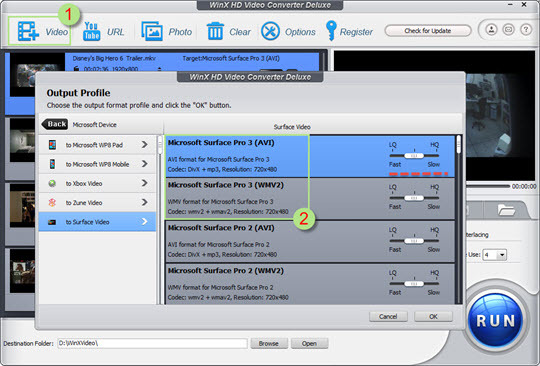 Since WinX HD Video Converter Deluxe supports choosing expendable USB storage, you can also save video(s) in a MicroSD card and then plug it in SP3/SP4 for playback. After checking the options you need under preview window, eg. "Merge Output Video", just press the blue "RUN" button to set out converting video to Surface Pro 3/4 with no difficulty. You can see the stop the process in conversion dialog box. 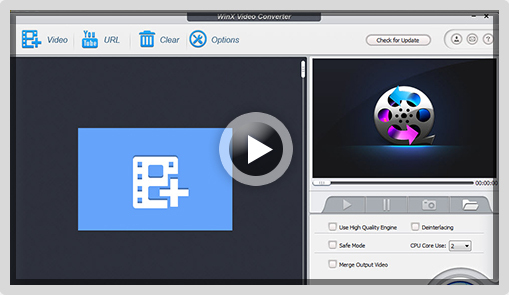 WinX HD Video Converter Deluxe can help you (download) convert (YouTube) SD/HD/4K UHD videos to MP4, AVI, MP3, WAV, iPhone, iPad etc. general format/gadgets. It also work as photo slideshow maker and screen activity recorder, 300+ online sites video downloader (on Mac).